Edge-to-edge capacitive glass combined with the elegant Control4 user interface reveals the most visually stunning Control4 touch screen to date. With new optional intercom capability, a choice of AC power or Power Over Ethernet, wired or WiFi connectivity options, and four programmable buttons for customized commands, this flexible solution is perfect for every room in the house. Compatible with virtually any new or existing home with options in power (AC or Power over Ethernet) and network connectivity (Ethernet or Wi-Fi). for both the 7" and 5" models. Enable optional intercom* functionality to provide whole-home communications between InfinityEdge Touch Screens. *License required for intercom activation. 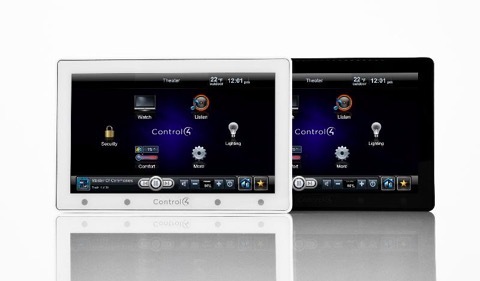 Compatible with other Control4 InfinityEdge Touch Screens. The Control4 License for Intercom enables the optional intercom feature* so you can hold a conversation with someone in another room, send a message to all rooms in the house, or even monitor the baby's room. "Do not disturb" and privacy features are available to provide specific control over the use of the intercom feature. Compatible with other Control4 InfinityEdge Touch Screens. A single electronic license activates intercom functionality for all InfinityEdge Touch Screens in the project.